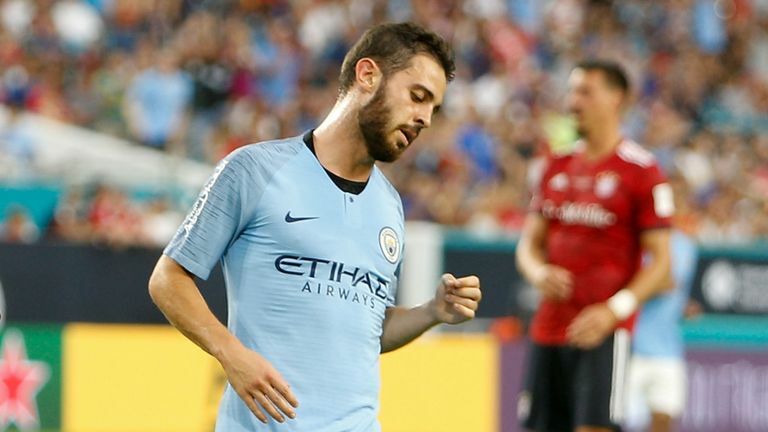 Manchester City came from two goals down to end their International Champions Cup campaign with a 3-2 victory over Bayern Munich at the Hard Rock Stadium in Florida. The Bundesliga champions put an end to a bright start from City, racing into a 2-0 lead thanks to goals from Meritan Shabani (15) and Arjen Robben (24). Substitute Bernardo Silva replaced Riyad Miahrez, who picked up an ankle knock, in the 27th minute and he brought Pep Guardiola's young side back into the game in stoppage time at the end of the first half before Lukas Nmecha (51) levelled the scores after the break. City's comeback was complete in the 70th minute as Silva grabbed his second of the game to hand the Premier League champions their first win of pre-season.